When I first heard of Drive, I knew I would like it. I grew up on car shows and movies, such as The Dukes of Hazzard, Cannonball Run, and Smokey and the Bandit. Plus, this show had one of my favorite actors in it – Nathan Fillion. Now perhaps Nathan’s character in Drive acted a bit much like Malcolm Reynolds from Firefly, but that’s okay. Both had lost something very important to them. The difference is that Malcolm Reynolds had little to live for save for flying another day while Alex Tully was obsessed with finding his kidnapped wife. The basic premise of Drive is that contestants are forced into an illegal cross-country race with high stakes backers behind them. 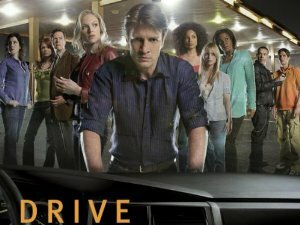 The star of the show is Nathan Fillion as Alex Tully, whose wife has been kidnapped by the powers behind the race. He has a secret past, one which drew him into the race. What’s sweet is that he drives a 1972 Dodge Challenger. Other contestants are two half-brothers who recently found out about each other, a soldier and his girlfriend, a mother who is trying to protect her child, a father-and-daughter duo, and several others. There’s even a lady who got into the race due to a race that happened a generation earlier, one that had profound repercussions on her life. Oh, and the guy who is playing the representative of the race is priceless. Drive is a fantastic show, and FOX played true to character by canceling it before its time. The decision to cancel Drive once again makes me ask…what the FOX? THE GOOD: The show is highly character-driven, and was making some real progress into character development before its untimely demise. The high action adds to the clever dialogue. Truly, this was a car show for the new millennium, providing a fast-paced, visually attractive, and story-driven series. THE BAD: The show falters in that it probably shouldn’t have been a TV show to begin with. I could see getting a season or two out of it, but in the end, the premise is better suited for a movie or mini-series. It is a finite story, one that must eventually come to an end. Furthermore, FOX made a huge mistake by only airing four episodes then having the other two only available through their site.